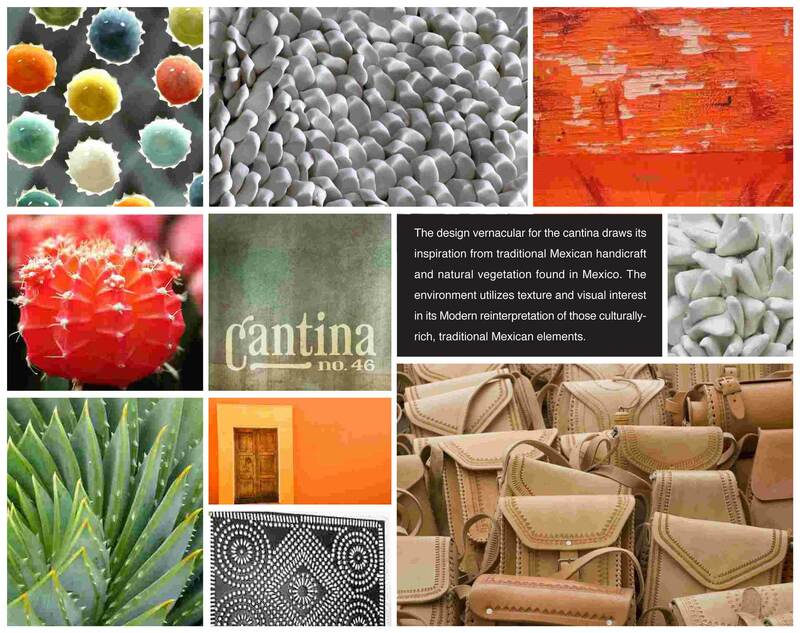 The design vernacular for the cantina draws its inspiration from traditional Mexican handicraft and natural vegetation found in Mexico. Ideation Studio was asked to create a Mexican restaurant inspired from Mexico’s rich cultural heritage, but translated in a fresh imaginatively modern way. The environment featured washes of midnight blue on the walls, contrasted against vibrant accents. The handcraft interpretation elements included: white pearlescent agave plant textured wall sculptures, rustic punched metals, hand tooled leather reminiscent of local rural crafts, raw woods, and hand-drawn ornamental signage. Named Cantina 46, the updated identity presents an intriguing mix of traditional elements interpreted in a contemporary way.